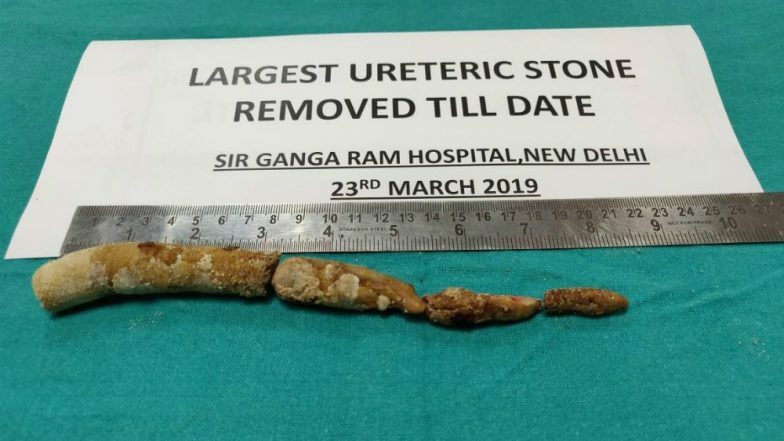 New Delhi, April 10: A team of doctors in Sir Ganga Ram Hospital here has removed the "largest ureteric" stone from the ureter of a 35-year-old woman from Uttar Pradesh, the hospital said on Tuesday. The stone was 22 cm long and weighed 60 grams, said a hospital statement, adding that its length was approximately the same as that of the ureter -- a urinary pipe leading from the kidney to the bladder. The normal length of the ureter is around 25 cm. 856 Kidney Stones removed through Minimally Invasive Surgery in 45-year-old Male.